A Florida State basketball game at the Donald L. Tucker Center is as exciting as it gets! Florida State fans are spoiled by more than just a great basketball team playing in the nation’s finest conference, they also get to watch the game in surroundings that are as modern as any in the country. A staple in the Tallahassee community for 33 years, the Tucker Center became even more inviting with nearly $17 million in facility upgrades prior to the 2014-15 season. 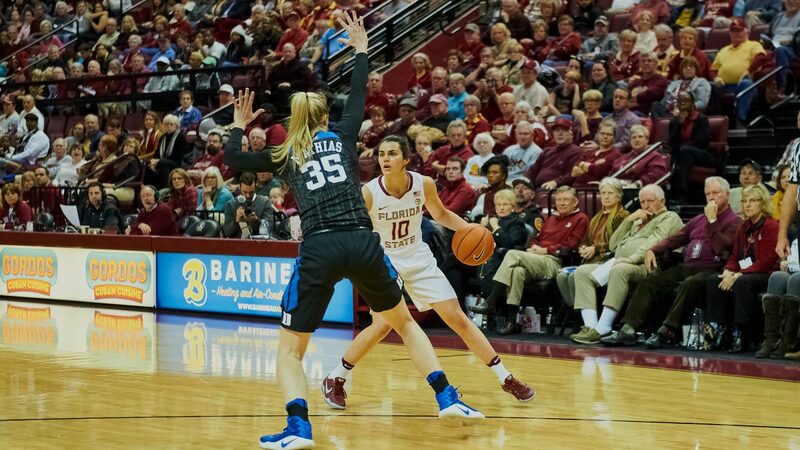 The improvements for both the Florida State men’s and women’s teams have produced an enhanced gameday experience for fans. • A new state-of-the-art high definition scoreboard is being installed and hung at the center of the arena. The new jumbotron has been called a “multimedia center” with endless video capabilities run by Panasonic. • A 360-degree ribbon board will run through the arena and provide statistics, advertising and video for in-game promotions. • A brand-new sound system providing high-quality acoustics for music, in-game announcements and other related activities. This will make an enormous difference for basketball games as well as concerts, musicals and other events that utilize the Tucker Center. • The game floor has been updated with the new Florida State Garnet and Gold colors. • Florida State University is committed to making the Tucker Center district a popular hot-spot for students and fans. Moving forward, there are plans to add hotels and retail to make it an entertainment area. • Four LED panels will be added to the upper corners of the Donald L. Tucker Center, providing clarity with statistics and other in-game functions. The Tucker Center is the home for Seminole basketball, and the multi-purpose facility comes alive on game day. 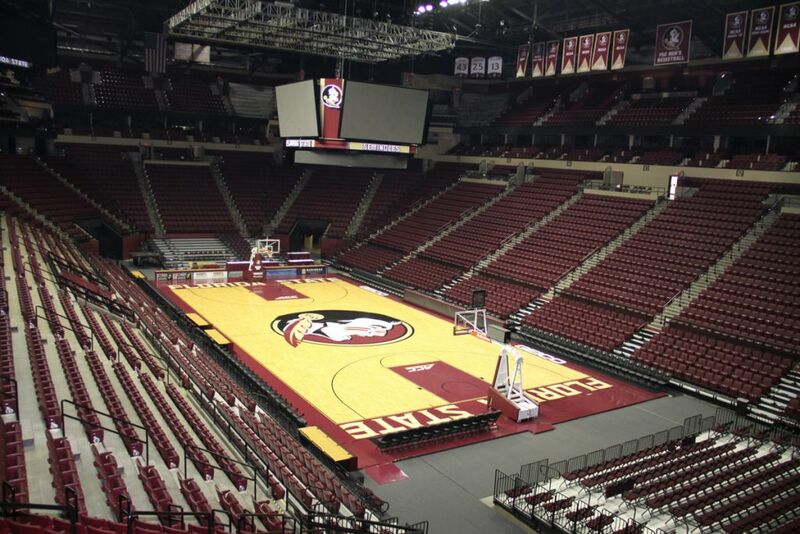 So impressive is the facility and the general atmosphere of an FSU basketball game that the Tucker Center and Florida State University served as the host of the first round of the 1995 Men’s NCAA Basketball Tournament. Since that time, numerous improvements have been made to the already-outstanding structure. Prior to the 2000-01 basketball season, the Tucker Center completed an expansion project which began in October of 1998 in which 34 luxury suites and 468 club seats at mid-level in the arena were added. In addition, the upper level seating was configured to offer better viewing and additional concession stands and restrooms were added. 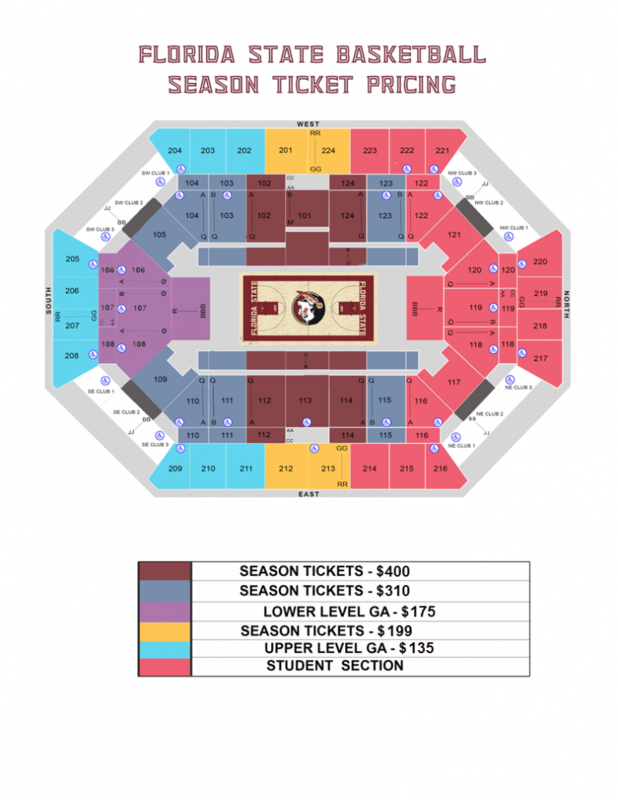 11,500 seats are available for fans of FSU basketball, who are treated to one of the most spectacular shows in college hoops. Adding even more appeal to the facility is the Tucker Center’s restaurant, the Spotlight Grill. This 450-seat arena-view restaurant includes an outdoor patio and ledge seating for viewing arena events. The multi-purpose facility, which opened its doors in 1981, covers over 22 acres in the heart of Tallahassee’s thriving downtown district. The Tucker Center is only two blocks from the Capitol building and is just across the street from FSU’s nationally-acclaimed College of Law and Center for Professional Development. The complex covers over 18,000 square feet with 119-foot ceilings in the main arena. The Tucker Center is actually three different areas combined under one roof. The main arena, where FSU hosts its home games, has also been home to some of the nation’s top musical concerts and Broadway plays. The Exhibition Hall, which joins the main arena via a spatial hallway, can seat 5,000 for an event or serve as an indoor display area. The complex also features a terrace, which is popular for outdoor hosting. As one of Florida’s busiest venues, the Tucker Center completed a $1.2 million renovation to its six meeting rooms, covering some 16,000 square feet. Because of its versatility and accessibility, the Tucker Center continues to be a popular location for trade shows and conventions.